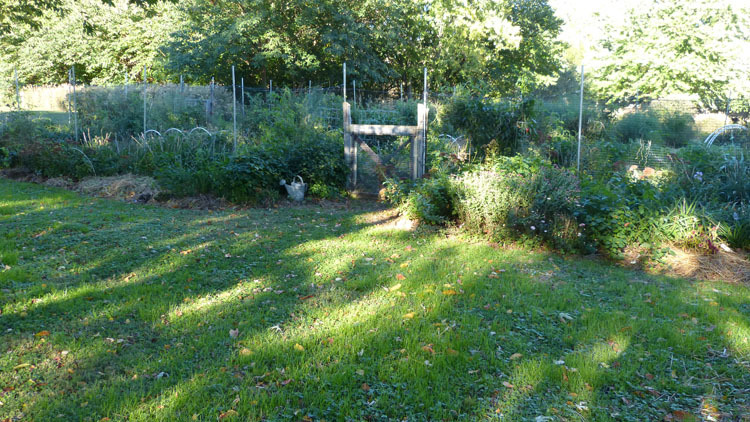 The season of hot weather crops is closing and the season of cool weather crops and winter garden preparation has begun. 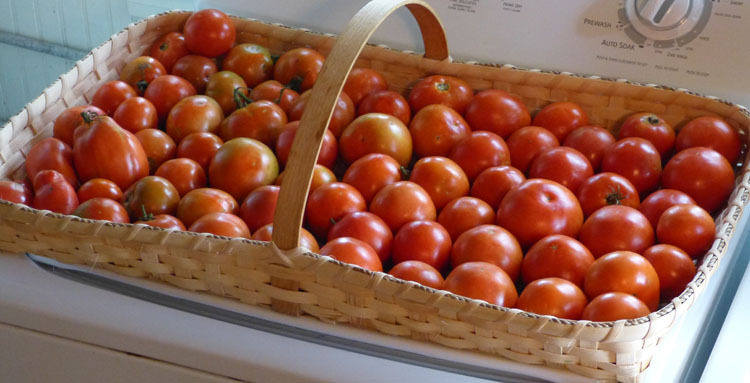 Tomatoes still hang heavy on the vines and I’m harvesting 4 to 6 baskets a week — which amounts to 30 to 40 pounds. Thus, I’m still making roasted tomato sauce each week to freeze for winter use. Time to make tomatoes sauce. I’ll wrap the best producing plants in RCF (row cover fabric) at the first prediction of temperatures falling into the mid 30s. As you know the weatherman can’t be but so precise and the temperatures can easily fall to a few degrees below predicted temps. Usually, we’ll get another month of nice daytime temperatures that will make it worth the extra effort. 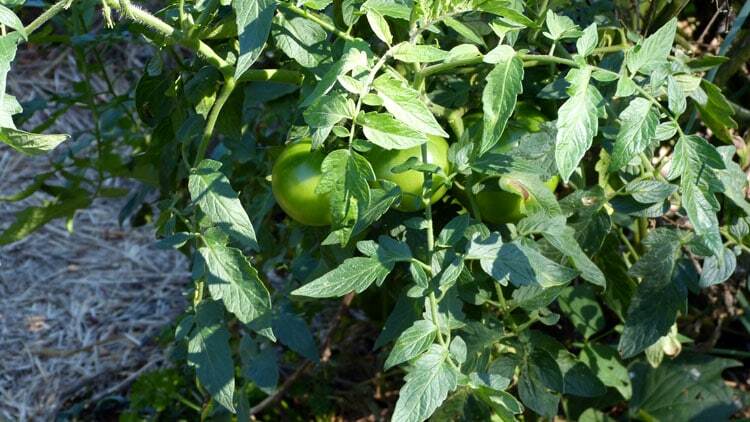 As weather dictates I’ll pick the remaining tomatoes and keep them as described in my post, More About Storing Tomatoes. Tomatoes still going strong in spite of cool nights. 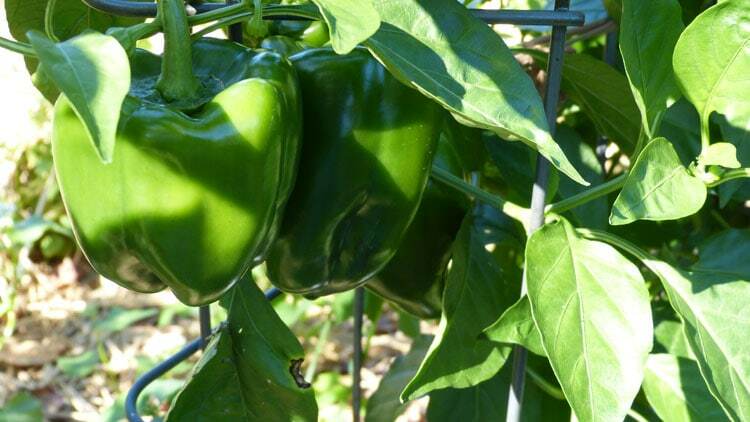 Peppers are my exception to keeping crops harvested. Of course, I pick at least 4 a day for fresh use. But I leave the others on the plant to get larger and turn red. They are so sweet and delicious that way! When temperatures drop I’ll wrap the pepper plants in RCF. I want to get all the red peppers I can. 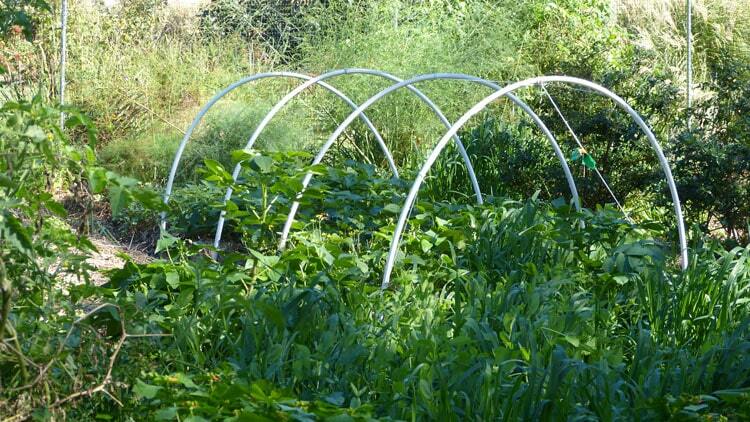 At some point I’ll harvest them all — even if green — and freeze for winter use. Some will keep in the frig for fresh use for at least 3 or 4 weeks. There are more than two dozen peppers on this plant. I had eggplant in grow bags again this year, but in a spot that received constant sun. Although they look great now, they didn’t during the summer drought. I even hauled buckets of water to them since they were in the grow bags, but they still didn’t do well until there was a break in the weather. Last year — where they had afternoon shade — they loved it — in spite of drought. I’ll wrap them with row cover fabric when night time temperatures demand it. The very small eggplants probably don’t have time to mature, but the medium sized ones will. The setting sun made for too bright a picture, but I was anxious to get this up — so forgive the brightness. The plant is pineapple sage in all it glory —- but the eggplant is directly behind it in the picture on the other side of the garden fence. 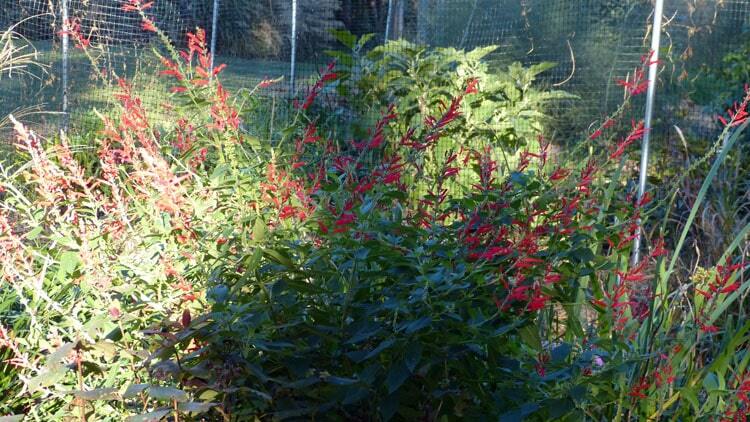 Here’s a better photo of the red blooms of the pineapple sage. And by the way – in case you’re not familar with this plant — it smells JUST like pineapple. I still have 1/2 row of potatoes remaining. They’re sprouting — which I regret. Nonetheless, when I harvested some for dinner the other night and broke the long sprout off — they were still delicious. I was surprised, but delighted. 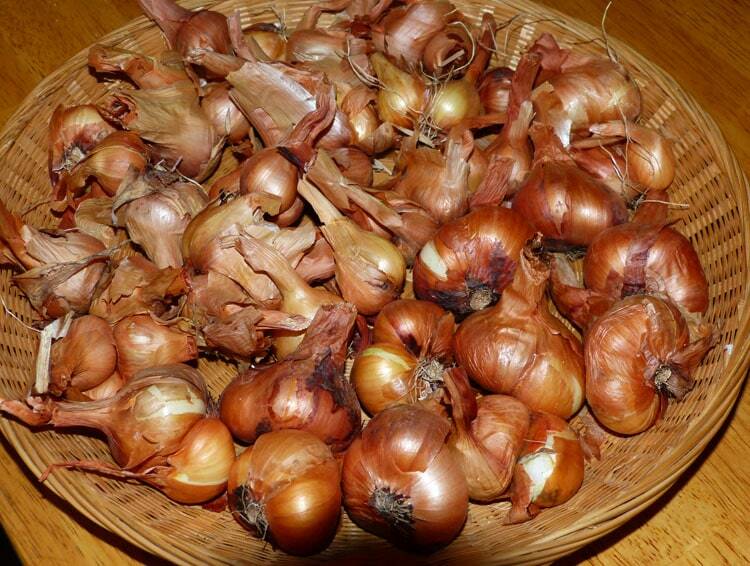 Still have about 500 cured onions in the house and looking great. Lot of spring onions are coming up in the garden. Always a treat to have those in the late fall and winter. 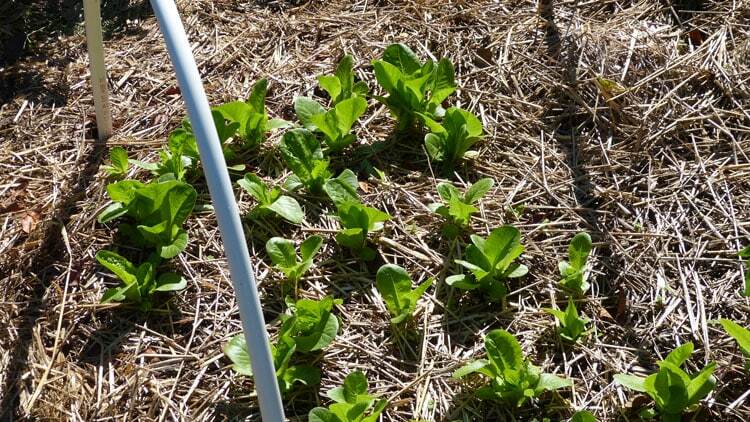 Lettuce planted in September is looking great and growing. Still have beautiful chard that I planted at the shady end of the garden last spring. Bill just put the hoops over this bed today. I still have more lettuce to plant in it. I’ve still got newly started lettuce, kale, mizuna, carrots, bunching onions, and tatsoi to plant. Garlic and multiplier onions go in Sunday. I turned under the 3 inch tall buckwheat in that bed a few days ago, so it’s about ready for the new occupants. Multiplier onions. 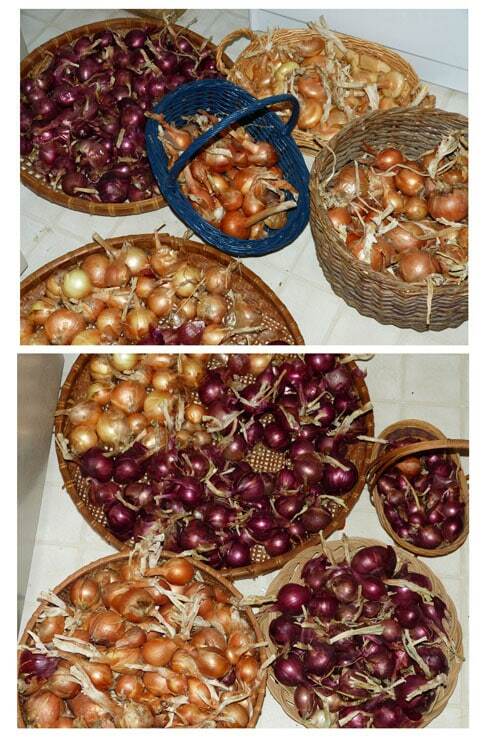 Great back up onions. They store up to a year and half if necessary. All of the various plantings of buckwheat have been turned under. I still have to plant cereal rye in some of those spots. I’ll do that Sunday too. Other plantings of rye, oats and/or field peas are looking wonderful. 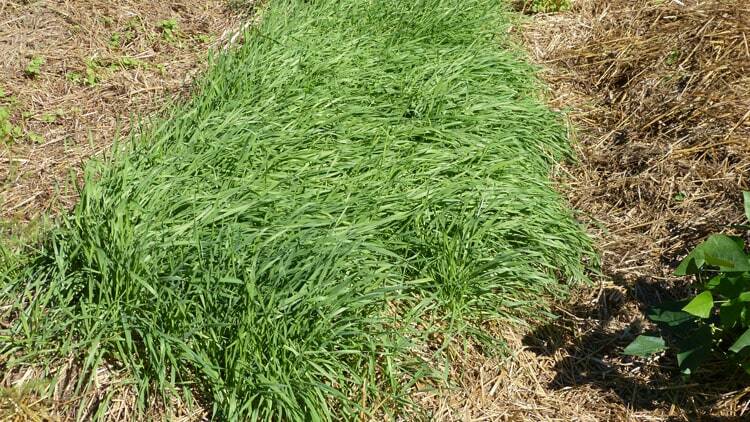 This is cereal rye (winter rye). The bed to the left was planted with buckwheat which has been turned under. I’ll plant garlic there on Sunday. The hoops over my beans are a little taller than the other hoop tunnels will be, but I wanted to make sure I had plenty of air space over the beans. (This is one of the suggestions that Gayle made in her comment last September.) By the way – the row in foreground is oats and field peas and a small patch of beans at the end. All but one of my old make shift cold frames are being retired this year because they’re falling apart. The hoop tunnels are new for me and I’m very excited. I decided on hoop tunnels the minute Gayle — a TMG reader — told me about her’s last September via a comment. I did my homework and learned what had been successful for others in order to make the project as successful for us as possible. But when it really comes right down to it — there are variables for everyone and you have to try it hands-on before you know what common problems will be specific to your situation. For example Bill cut the rebar 12 inches long. At least 6 inches of it is in the ground and the pvc fits over the 6 inches that is above ground. Hopefully, this will be enough to keep the pvc from jarring loose in heavy winds. Also, row cover fabric can tear in heavy winds and I hope that I can fit them over the hoops and wire brace (the purlin) in a manner that will keep that to a minimum. I’ll just have to play it through. The same thing applies when I use plastic as my second layer over the row cover fabric. Looking through the fence you can see the various hoops already in place waiting to be covered. The one at the far right is the tall one over the beans shown in the previous picture. The setting sun was so bright the far background would not show. In addition to everything else going on, the editor of Out Here Magazine (published by Tractor Supply) emailed me the other day and asked me if I would take an assignment to write two articles on peppers. One for the next issue is to be a story explaining the range of heirloom peppers; and one for the website is to offer tips and techniques to readers for being successful with peppers. Of course, I said YES! and we’re preparing our winter coverings as well. Hopefully you’re making notes about what you want to do differently and what you want to order for next year. Have fun and do as much as you can. We can take a break when the ground is frozen. Your efforts now can take next year’s bounty and garden to a new heights! 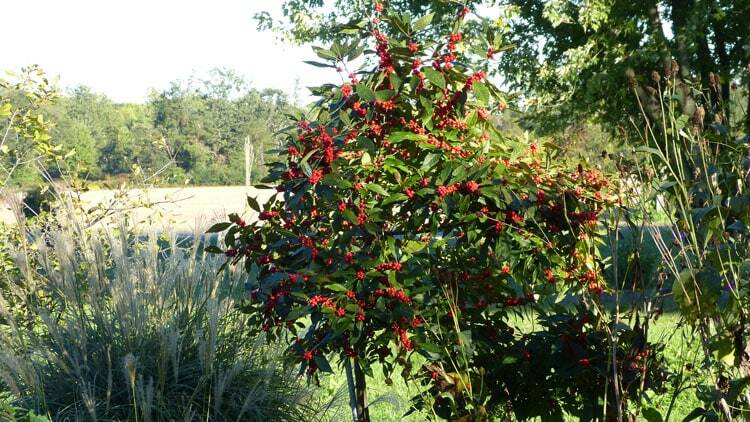 In ending I just wanted you to see how beautiful the Ilex is this year. 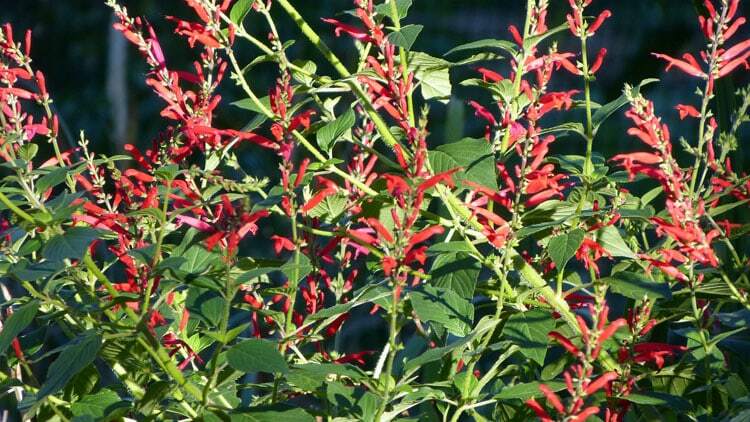 The Pineapple Sage is beautiful – lovely photo of it. I love seeing these updated throughout the year. I must begin to do the same – how nice it would be to stand in the same spot throughout the year and photograph the progression through the gardening year. It’s helpful to ‘see’ your garden Theresa, and always inspiring. Theresa, I’m sure you’ll talk more about this when the time comes, but have you given much thought to how to secure the row cover fabric? I saw a suggestion to buy some flexible pipe – just one size larger than the diameter of your hoops. Cut it into 4′ sections, and then slit it. Apparently, you can then put it around the row cover and the hoop and it will stay in place. I look forward to seeing your hoops in action. I did something similar one year with plastic, and I had beautiful salads through a very cold winter – no problem. Yes, I’ve given LOTS of thought to this Sandra. What you suggested is one of the ways I have planned. I’m not going to know for sure what is 100% until we have a lot of wind. Then everything is put to the test. I’ll take pictures and show. I hope you’re doing some winter growing? P.S. I appreciate your telling me the pictures are helpful. That encourages me to continue with them.